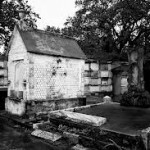 Founded in 1872, this well-known cemetery is the final resting place of 9 Lousiana governors, 7 mayors of New Orleans, and 3 Confederate generals. Singer Louis Prima also is buried here. Some of the gravesites here are said to house restless haunts. In addition to living sightseers, the cemetery is even said to draw ghostly “tourists” from their own graveyards to marvel at the beautiful tombs. The grounds were originally a racetrack, and reports say you can still make out the track outline. Grew up VERY close to this cemetery, learned how to drive there as a young kid with my grandmother. One side of my family is buried there. A close friend who died before making 20 yrs old is buried there as well. Growing up, I spent a lot of free time riding my bike and generally exploring the cemetery. I admit I snuck in there many times as a wild teenager. Brought friends in there to do things dumb kids do. One time, me and an ex girlfriend snuck in years ago. We were outside walking around at approximately 2am in the dead of the night. As we were walking and talking,we suddenly heard what sounded like a car door abruptly shut. To be fair, we were in a part of the cemetery where it seems to me improbable but still possible to have been someone at a residence opening their car door, but I don’t believe that was the case. There was no obvious indication as to where someone might have been nearby with a car, and regardless my then girlfriend & I abruptly left after agreeing we heard a car door shut. That’s it as far as any sort of (probable) paranormal incident during my extensive experience spending time in Metairie Cemetery. Fyi,I was a skeptic most of my life,till my family & I moved into a bigger house in the same neighborhood virtually next to Metairie Cemetery,but that is a different and longer story.